I'm saying this is the South. And we're proud of our crazy people. We don't hide them up in the attic. We bring 'em right down to the living room and show 'em off. in your family. They just ask what side they're on. Dixie Carter died yesterday. Carter, like Vivien Leigh before her, brought a great fictional Southern character to life. 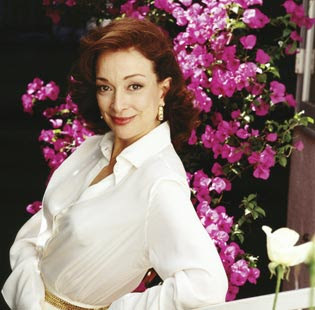 While Dixie Carter had a brilliant career on the stage and as a cabaret singer, she will forever be remembered as the loyal, compassionate, eloquent, dyed in the wool Southern decorator, Julia Sugarbaker on Designing Women. It was easy to conflate Dixie Carter with Julia Sugarbaker. The portrayal was spot on and a bit unfortunate as Carters effortlessness made the roll seem like no stretch at all. In the hands of lesser actress Julia Sugarbaker might have seems a caricature, but in Carter's hands, she was that woman you always admired and longed, just a bit, to be. In reality, Dixie Carter was not the liberal, enlightened Julia Sugarbaker. Carter's politics would make Sarah Palin look a bit like Jane Fonda. It was said that Carter made a pact with Designing Women creator, Linda Bloodworth-Thomason; she would spout whatever liberal crap Bloodworth-Thomason wrote and in exchange, Bloodworth-Thomason would write a show each season in which Dixie Carter would sing. On my "Bday" play list on my iPod, I put an audio hijack of Dixie Carter singing on Designing Women. This morning after I heard of her death on the news, I was in the kitchen and instinctively turned on the iPod. There was a brief pause and then, I heard Dixie Carter. Today, she is on the side of the angels. I grew up in southern Oklahoma, not deep south but my grandmother came from Georgia, my mother grew up in Louisiana, my father's family came from Tennessee. You get the picture. We used to watch Designing Women with our then young son. He liked hearing the voices because they reminded him of what my college roommate and I sounded like. I always thought I was Annie Potts. My son said, "No, you're the one in charge." Still tickles me. Dixie, I hope you don't rest in peace but wherever you are you are stirring things up and making people think while they laugh. I will miss this southern lady. Just ordered the first three seasons of Designing Women on DVD from amazon.